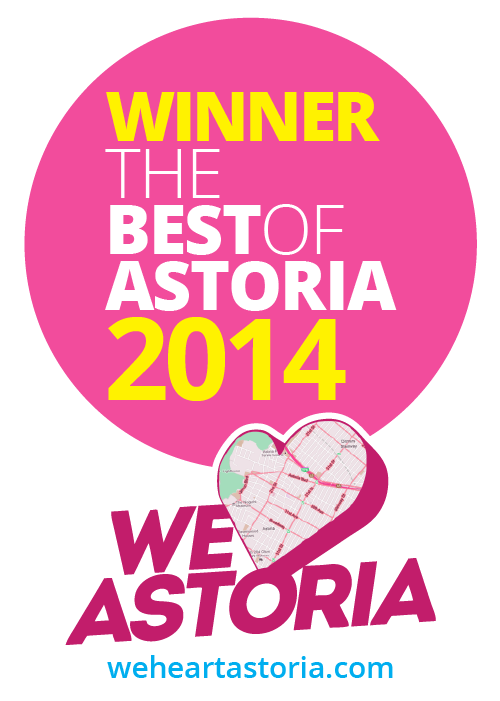 We’re so excited the time has come to announce the 2014 Best of Astoria winners! Enjoying the last couple of weeks of nominations and all your spirited voting, Astoria, it’s our pleasure to announce the best of the best of Astoria, as chosen by you. A big congratulations goes out to all the nominees for being totally awesome, and even though there can only be a few winners, we feel fortunate to recognize all of the amazing nominated businesses. Hats off to everyone for their hard work and dedication – we look forward to visiting and patronizing you all this year and onward. Was rooting for Astoria Books as best newcomer. Perhaps next year two categories – best newcomer: food and best newcomer: nonfood? The party was amazing. Thanks to all who helped organize! As a wise dude once said – that’s just, like, your opinion, man. These listings are 2014 popular opinions. Maybe more maybe less informed than yours. Favorite does not have to mean better. Did someone say Wafels? Where are they? And yes, probably need to give de Mole another try soon. Thanks for sharing their praises. Rock on Astoria. Agree with Maria on De Mole! How can you classify MexiBBQ as Mexican anyways? First of all, De Mole is the finest and most authentic Mexican restaurant and is almost never mentioned. Not sure how you can call MexiBBQ and Pachanga Patterson better Mexican food than that. Second, Wafels and Dinges is better than El Rey del Taco? Really? Plus, Wafels and Dinges is an offshoot of a Manhattan business. It is not local. I agree with both previous posts! Also what about Frankie’s Souvlaki on 31st and Steinway? Not even an honorable mention. Try to walk by and not get a stick to go. Wow..Il Bambino as favorite restaurant, are you kidding me??!! I like the place but its a sandwich shop or a glorified delicatessen.If this is all true and the voting was legit then it seems people do not know how to have a real meal in a RESTAURANT anymore. Yeah, King of Falafel got robbed! That being said, we are lucky to have so many great nominees (and more awesome places that weren’t even among the finalists). I don’t quite get how Wafels & Dinges got nominated. Sure, they have a truck here, but they’re all over the city and are based in Manhattan. All the others are local.